Out of home is the only traditional form of media that has not been weakened by the rise of digital. In fact, digital has strengthened OOH, allowing campaigns to connect with people on a more personal level. And that is what the next year will bring for out of home: A rise in connectivity. Out of home ads already ask for feedback, send text messages, ping people with coupon offers and interact on social media. But in 2015 and beyond, the focus will be on even more intimate connections. The aim is to anticipate what a consumer is looking for and facilitate that quest. “The more OOH can connect with consumers and commuters, the better the outcome for OOH advertisers,” says Jack Sullivan, senior vice president and director of the place [out of home] center of excellence at Starcom USA. What is all this leading to? Media Life spoke with media people and others in the OOH industry to come up with predictions for the medium in 2015. Connectivity means interactivity, and that means digital. There will be a rise in the deployment of all forms of digital out of home, from billboards to place-based media like screens in doctor’s offices and in taxis. A study by Nielsen and the Association for National Advertisers found the share of spending on multi-screen advertisements, including place-based media, TV, tablets and smartphones, will more than double over the next two years. These screens can be placed at the point of purchase and will drive more sales than traditional OOH. “Data, more digital screens/signs and better audience information are critical for out-of-home’s potential to take off. 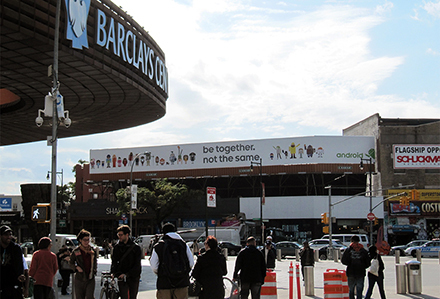 We’re at the edge of consumer spontaneity, and OOH will play a sizable role,” Sullivan says. Digital, mobile and out of home are the only advertising categories seeing sizable increases in spending right now. 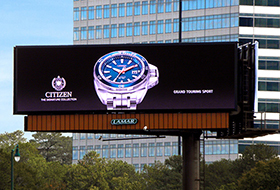 Analysts project spending for OOH will rise 5 percent next year, in line with gains over the past few years. What is interesting is that there has been a change in where those additional dollars are coming from. Years ago, the money flowing into out of home was being pulled from newspaper budgets. But now, buyers say, that money is coming from other places — magazines, radio, even television. Measurement is the lifeblood of out of home. It’s the industry’s biggest hope for the future because it proves OOH can compete with other media in terms of reach and return on investment. A push is being made to improve measurement of the medium. While OOH ratings company TAB has made big strides, there is still a long way to go. Expect measurement to become more sophisticated and offer media people better demographic information over the coming year, as TAB finds a new leader and reevaluates what’s to come for an industry that continues to change. Lamar Advertising Company (Nasdaq: “LAMR”) will release its fourth quarter ended December 31, 2014 earnings report before the market opens Wednesday, February 25, 2015.